LAS VEGAS, July 17, 2018 /PRNewswire/ -- Nintex, at the Microsoft Inspire conference, today released new research that shows company decision makers prioritize improving the customer experience (48 percent) first and foremost over the employee experience (29 percent) when budgeting for digital transformation technology purchases. 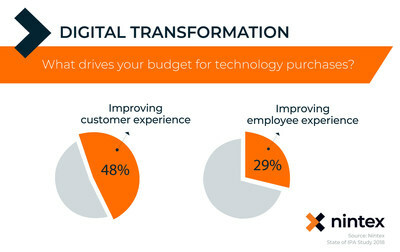 As the world's leader in intelligent process automation (IPA), Nintex believes this unbalanced approach to digital transformation strategy highlights a business opportunity for channel partners to further educate enterprise organizations on the role employee experience plays in digital transformation success, as well as to deliver best-of-breed technology solutions that digitally transform both the customer and employee experiences. The findings come from Nintex's latest survey of more than 450 decision makers and 650 line of business employees at U.S. based companies with more than 250 employees. The survey also reveals a disconnect between how company decision makers anticipate new technology investments will impact the day-to-day activities of their employees and how employees view their involvement in digital transformation efforts. In fact, decision makers believe half of employees (53 percent) are extremely likely to use new digital transformation-driven technology tools. However, the top reason why the same decision makers are focused on digital transformation is the anticipated gain in productivity (53 percent). Line of business employees, on the other hand, see their company's digital transformation strategy very differently—with nearly every respondent (97 percent) reporting he or she will use new tools implemented as part of the company's digital transformation efforts. "Focusing on customer success is critical for all enterprises, but we must not neglect the success of our employees in the process in order to fully realize the benefits of enterprise-wide digital transformation," said Nintex CEO Eric Johnson. "At Nintex, we believe that our channel partners are well-suited to advocate for both the customer and the employee as they provide robust technology solutions and services that help organizations around the world realize their strategic business goals." Johnson continues, "When enterprises automate, orchestrate and optimize both their internal and customer-facing processes, they will move closer to their vision of a digitally transformed modern workplace." Additionally the research shows that despite the relative newness of formalized digital transformation strategy, the majority of plans are notably mature and include incorporating process automation technologies (88 percent) to address business pain points (America's Most Broken Processes) and deploying process intelligence/analytics (62 percent). To learn more about this research, sign up at www.nintex.com/stateofIPAstudy to receive a free copy of the study when it launches later this summer.